UNAIR NEWS – There is a possibility of cancellation to the Head of Agreement (HoA) between Indonesian and Freeport made on July 12, 2018. 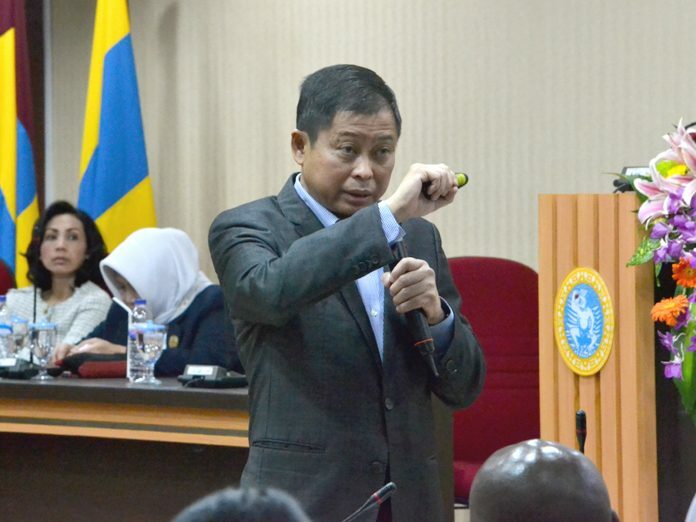 It was conveyed by the Minister of Energy and Mineral Resources (ESDM) Ignasius Jonan in a guest lecture at Postgraduate School Universitas Airlangga on Wednesday, August 8. Jonan admitted that the HoA, from a legal perspective, is non-binding. Either party can break-off the agreement or continue the agreement. However, he said that Indonesia agreed to sign it was because the HoA contained the procedures for transferring its shares as well as the payment. Basically, he said that if Freeport did not want to divest its shares, Freeport would not enter the HoA. In addition, he emphasized that the signing was a step and a form of Indonesia’s determination to get a better deal especially to get mineral downstreaming for the prosperity of the people. “This is like an engagement. It could be canceled. But, if you intend to cancel, why do you do it in the first place? The intention is to get married. If they did not want to get married, why would they agreed for an engagement. This is not a game, “he said. Before reaching the HoA stage, there was a long and tough process. According to Jonan, PT Freeport Indonesia’s permit of operation was gained in 1967, precisely on April 4, 1967, through the issuance of PT Freeport Indonesia’s First Generation Work Contract. Subsequently, in 1972, there was an initial export of 9,700 tons. On December 30, 1991, continued Jonan, there was a renewal of Contract of Work to Fifth Generation based on Presidential Agreement No. B-329 / Pres / 112/1991. Then, in 1999, there was an agreement to increase the production capacity to 300,000 per day. “In 2015, there was a techno-economic agreement on the feasibility study revision document. And, in 2017, there was a change of Contract of Work to become a Special Mining Business License (IUPK) for production operations, “he said. Jonan added, before the HoA was signed, a final negotiation agreement was held at the ESDM Ministry Office on August 27, 2017. There were four points agreed upon. First, the legal basis in the form of a Special Mining Business License (IUPK). Second, the share divestment for national participants is 51 percent. Third, PT Freeport Indonesia to build a processing and refining facility or smelter for five years or at the latest must be completed in 2022. Fourth, the stability of state revenues in aggregate is better. Meanwhile, according to Jonan, in the HoA, based on an agreement with Freeport-McMoran (FCX) on August 29, 2017, the resolution of the PT Freeport Indonesia (PTFI) problem was carried out through four agreements. First, changes in the legal basis of the CoW to IUPK followed by the Extension of Operations to a maximum of 2 × 10 years until 2041. Second, the obligation to build a smelter for five years, or not later than January 2022. Third, the stability of state revenues which is aggregately greater than revenues through COWs that are supported by fiscal and legal guarantees. And, fourth, PTFI’s share divestment is 51 percent.